Tampon Run, the creation of two high school students, switches out firearms as weapons in its game to question why gun violence is more socially acceptable than menstruation. Guns are fairly ubiquitous in media, from books to movies to video games. Two young programmers, though, are questioning why society as a whole is more comfortable with displays of gun violence than it is talking about menstruation. The web game Tampon Run, created by New York City high school students Andrea Gonzales and Sophie Houser, wants to bring attention to this inconsistency by swapping out firearms for feminine hygiene products. 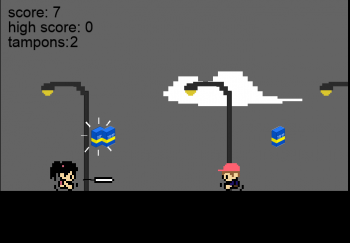 Taking cues from the "infinite runner" style of game, Tampon Run has players dispatching enemies in their path not with bullets but by throwing tampons at them. Touching the enemies drains your supply of the projectile, which you can refill by grabbing tampon boxes. Running out of tampons means game over. The game opens with a message from Gonzales and Houser, explaining their goal with the game. "Most women menstruate for a large portion of their lives. It is, by all means, normal," reads the opening text. "Yet most people, women and men alike, feel uncomfortable talking about anything having to do with menstruation. The taboo that surrounds it teaches women that a normal and natural bodily function is embarrassing and crude." Tampon Run ultimately seeks "a way of discussing the taboo in an accessible way," the game states. While it admits that giving enemies a face full of tampon might be a strange way to go about having this discussion, "its stranger that our society has accepted and normalized guns and violence through video games, yet we still find tampons and menstruation unspeakable." The game was created as Gonzales and Houser's final project for the "Girls Who Code" camp held earlier this summer. Regardless on what your thoughts may be on the concept, you have to admire two young programmers for being willing to not only make a social statement but also developing a game to accompany it. You can play Tampon Run for free here.